Lots of analog delay goodness, easy to tweak and light on the pocket – what more could you ask for? Considering the spurt of boutique effect manufacturers and an already thriving pedal market there is no shortage of delay pedals, ranging from slightly under $100 and some clocking above the $500 range. 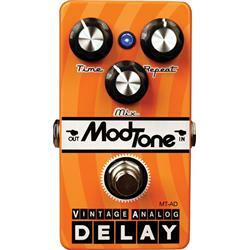 The Modtone MT-AD is one of the more affordable offering, and some might say at $99.00 street price, even a bargain in the analog delay category. According to ModTone, the pedal features period-correct vintage style components, smooth linear taper pots, high impact switches and top quality jacks. Coupled with analog components the pedal features the PT-2399 digital delay chip, so the pedal is not pure analogue by the sense of the word. The Modtone MT-AD has a buffered bypass switch. It can achieve delay times from short slapback to 350 miliseconds of delay time. It has three knobs: Time, Repeat and Mix. Time controls the delay time, Repeat the delay repeats and Mix the amount of delayed effect mixed in with the clean signal. The MT-AD is housed in a rugged all-metal chassis, painted in vintage orange, in size and appearance similar to some vintage pedals, like the MXR line. The MT-AD can be powered by 9 volt adapter (not supplied) or 9 volt battery. One thing that became apparent right away is that the MT-AD is very easy to operate and all the results are musical. The unit can achieve a short time slapback and more expressive and expansive delay sounds reminiscent of 70s prog rock bands. From short rhythm slapback to spacey echo sounds - it does it all, and it does it well. With little tweaking I was able to dial in a great lead guitar sound, which when coupled with the right distortion was downright godly. The pedal is fairly straightforward and does the job well, with no extra frills. The MT-AD imparts a pleasant warmth to the signal which was a welcome change from my staple Boss DD-3 delay, which in comparison sounded harsh and unpleasant. Unlike some digital pedals, the MT-AD did not run down the batteries as quick. Changing batteries during a gig is not a pleasant experience, as one has to unscrew the back plate out, which requires a Phillips screwdriver. Most guitarists would prefer to power it via a power supply so that should not be an issue. As far as sounds are concerned, this pedal does the analog delay staple sounds very well. For those looking for crazy warble tape sounds and analog signal degradation, the MT-AD might not quite fit the bill, but for most guitarists looking for warm and musical analog delay, this box will deliver in spades. I am very impressed by this delay unit. While some boutique pedal fans might scorn at the digital tone generator, most of us who live in the real world and care about tone first, would be pleasantly surprised by the pedal's tonal quality. The MT-AD found a permanent place in my effect path and by the looks of it, it is there to stay.